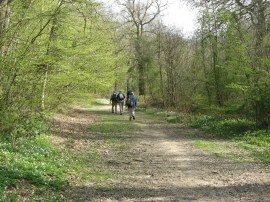 The Greensand Way is going to be the main group walk for 2010 and we walked this stage on Sunday 18th April 2010. Many years ago I had walked most of the Kent section of the path, starting at Sevenoaks, and it had been a long held ambition to walk the path in its entirety. Five of us set of from Ham Street where there is a very small plaque, photo 1, marking the start of the Kent section of the walk attached to a post at the junction of the B2067 and the Street. 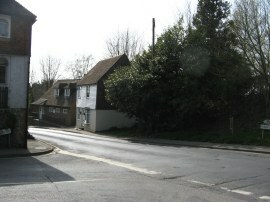 The route then heads up the Ashford Road, turning to the right to pass through Ham Street station, photo 2, before crossing the railway lines and heading down hill beside a field to reach the Ham Street Woods National Nature Reserve. Here the Greensand Way turns to the left linking up with the route of the Saxon Shore Way as it passes through the woodland, photo 3. 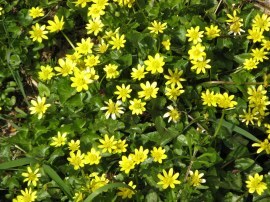 There were large patches of wood anemones in flower under the trees as well as a few clumps of celandines, photo 4. Leaving the woodland the route continues ahead along Gill Lane where we were followed by a dog that seemed determined to come with us rather than return to its owner. At a T junction the route turns right into an unnamed lane before taking a footpath on the left that heads over a field to join a field edge path. At the end of the next field the path continues ahead with fields on the left and woodland on the right to reach Capel Road. Continuing ahead the route then crosses another small field to reach Brisley Lane. Reaching a driveway the route heads to the left, passing a house along what was at the time a rather muddy section of path to reach the A2070. 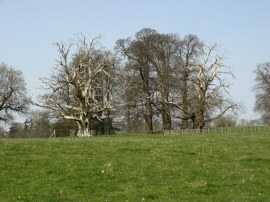 The route then heads alongside the busy main road for a short distance before taking a footpath on the left with a field to the left and Golden Wood to the right. As I had been walking along the main road I spotted a dead Blackcap on the verge, the first chance I had of examining the bird close up although it was a shame it was dead. Reaching the end of Golden Wood the path bends to the right heading over fields to reach the isolated and rather run down buildings of Lone Barn Farm, photo 5, a setting that almost looked as if it could be in the peak district. The route then joins a farm track that is followed across a number of fields from where floodlights of Homeland Stadium, home of Ashford Town FC and where the mighty Maidstone United are playing for the 2009/2010 season could just be made out way to the left. In fact I had been to see Maidstone play Ashford (MX) there only the day before, the Stone winning 2-0. Eventually the farm track reaches a farm yard, joining a tarmac track that heads past a campsite and on to Steeds Lane. Here the Greensand Way joins a footpath at the junction with Stumble Lane and heads over a number of fields before passing between some buildings to reach Bond Lane. Heading over the road the route then heads diagonally over another field before turning half right to join another footpath that runs along a field edge to Church Hill on the outskirts of Kingsnorth. 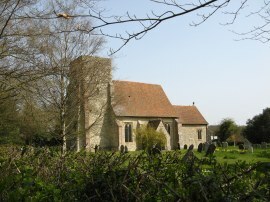 Heading to the left up the road we stopped for a short break at St Michael's & All Saints church, photo 6. From the church the Greensand Way heads along Church Hill to cross over the Ashford road and then continues ahead along Pound Lane. Where the lane bends to the right we joined a footpath on the left that heads across two fields to reach a road, Long Length. On the map the Greensand Way is shown as heading to the left down the road before joining a footpath on the right however it was signposted as heading straight across the road to join a footpath, photo 7, that headed diagonally across a large open field which then links up with the route as marked on the map. 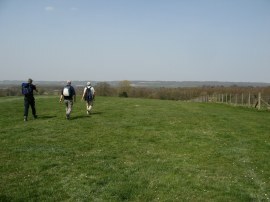 The route then follows a field edge path that becomes a farm track that leads down to a road at Chilmington Green. The route then follows the road to the left before turning to the right at a T junction. Just past a house on the right the route joins a fenced track that heads gently uphill towards another house where the route takes a rather hidden gap through the hedge on the left to join another field edge path that bends round to the left. The slight increase in elevation opening up some pleasant views across the Kent Countryside, photo 8. At first we had missed the gap in the hedge and headed over the stile in photo 9 to join a road, assuming it was the correct route as it was the obvious exit from the little field we were in however fortunately we soon realised we were off course. 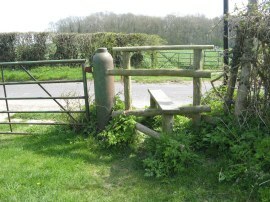 The gate beside the stile was quite unusual, the support for the gate being made from an old metal cylinder. Once on the correct path we soon reached Mock Road where the route heads to the right along the road before taking a footpath on the left that runs between fields towards a new housing development. The houses themselves didn't seem that bad but they were so densely packed into the site with hardly any garden space. The Greensand Way then crosses over the A28 and heads over a small patch of scrubby ground before heading round some houses into a small road, Hill Crest, which leads down to the Ashford Road in Great Chart where we stopped for lunch in the churchyard of St Mary's Church. 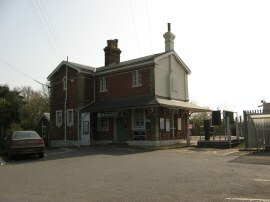 Maria was taking the train back from Ashford and stopped for a drink in a pub in Great Chart so it was just four of us who set of after lunch along the Ashford Road. At the junction with Ninn Lane the route links up with the route of the Stour Valley Walk, heading past a cricket pitch and along a track between fields to cross over some railway lines before continuing on to reach the River Stour, photo 10. Once over the river the route continues ahead heading uphill across parkland type grounds where there were a number of dead trees which had lost most of heir bark which made them appear much lighter than the surrounding trees, photo 11. 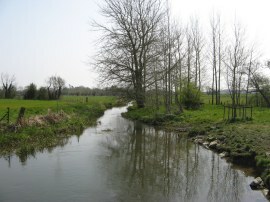 The path passes close to the backs of some houses before bending round to the left to join a footpath which runs alongside Godinton Lane, passing through an area of trees to reacha road. 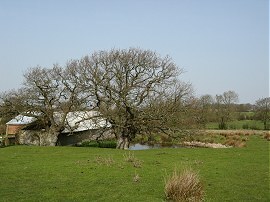 The Greensand Way crosses this road to head over more grazing pasture, descending ever so slightly to cross a wooden bridge over a small stream before eventually reaching another road which the route continues straight across. The path then heads across another three small fields to reach another road, West Street, where once again the route continues straight across. 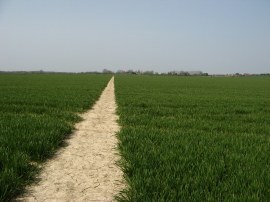 The route then bears to the right over a field, photo 12, to join a path running along the edge of the field. 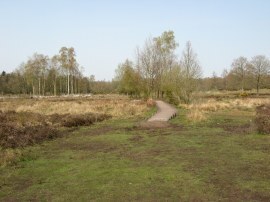 A short distance further on the route links up with the route of the Stour Valley Walk, the Greensand Way turning to the right to head down to a track where the routes turn to the left to enter Hothfield Common, photo 13, which is the last substantial area of heathland and lowland valley bog left in Kent. 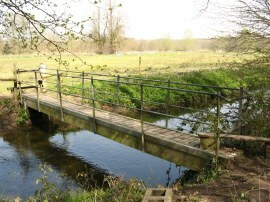 Leaving the common the route crosses a couple of small fields before taking a footbridge, photo 14, over the River Stour and heading up through Coldham Wood. Leaving the trees the route crosses over Ram Lane and heads gently uphill over a field to rejoin Ram Lane. Here the route turns to the right along the road towards Little Chart Forstal. The route passes a cricket ground which is surrounded by a number of extremely attractive, and probably very expensive, houses before joining a track on the right which runs round the side of a house before turning to the left and heading out to a field from where there were good views across the valley to the North Downs. We had a short break admiring the view and we were able to spot a couple of gliders flying above the downs. However the walk also coincided with the time when there were no flights due to the Icelandic volcanic eruption, closing the European airspace, and it was odd not to be able to spot a single aircraft contrail in the sky. What we did spot however was a very scantily dressed man sunbathing by the hedge a little further on from our resting pace. 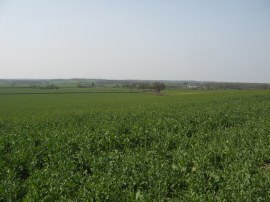 After our break we crossed over into the next field and took a footpath that led diagonally across the field to the right to join another road on the outskirts of Little Chart. Here we headed to our right along the road. A little past the rather ugly brick church the Greensand Way leaves the Stour Valley walk to join a footpath on the left which heads across a small field before entering a fairly extensive area of orchards. 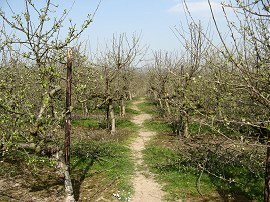 At first the path heads diagonally through the trees, photo 15, before heading along the side of the orchard. After crossing a couple of unplanted areas the route crosses a minor road before once again continuing ahead alongside a set of orchards. Reaching the outskirts of Pluckley the route crosses down the side of the cricket pitch, where an early season match was taking place, to join the Smarden Road. Here we turned to our left and had a only very short walk down the road to reach the junction with Street, photo 16, where we ended this stage of our walk along the Greensand Way. It was then only an equally short distance along the Street to our parking place outside the church. The GPS made this walk 15.5 miles long, almost all of which had been along the Greensand Way. 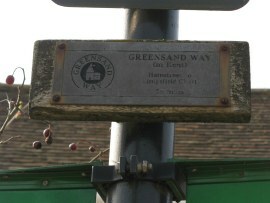 I have uploaded the route of the walk which can be accessed here Greensand Way 1 Route.